Last but not least, we have things that are pretty. They may be practical, but dang are they pretty. 1: Anything from Chameleon Fine Furniture* would be awesome, but it's the Jessica today. 2: A few Finn Pendants, aglow over the work table would be nice. 3: Toss this Hand-Blocked Triangle Pillow on for a little personality. 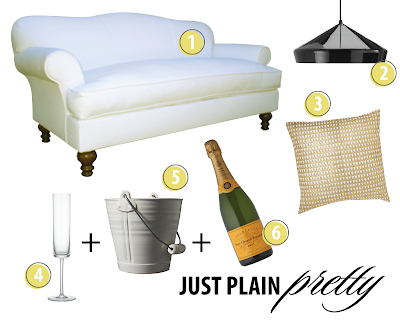 6: Make a little something special (yummy Brut Champagne!) for client meetings. *Just a note about the Chameleon Fine Furniture: I have one of these in my home already and it's amazing. I got to choose every part of it from the size to the fabric to the legs. It's amazing, and I really want a chaise to go with it!